The virtual long/short equity Hedge Synergy Fund was started on October 1, 2004. The web site was launched April 23, 2005 and is updated weekly (see Barron's classified ads 4/25/05 page MW6). The above chart shows the returns of the virtual Hedge Synergy Fund NAV (net returns after deducting Performance/Asset Fee), long portfolio, short portfolio and the S&P 500. For an explanation of my methodology please see Hedge Strategy. The above chart shows the performance of the virtual Hedge Synergy Fund NAV (net returns after deducting Performance/Asset Fee), Hedge Synergy Fund Gross returns, Long Portfolio, Short Portfolio and the S&P 500 for the first quarter of 2019. On March 29, 2019, the short stock portfolio contained 24 stocks so the short portfolio was 24% of the fund equity and the long stock portfolio was 100% of fund equity. This made the funds net exposure 76% and the gross exposure 125%. 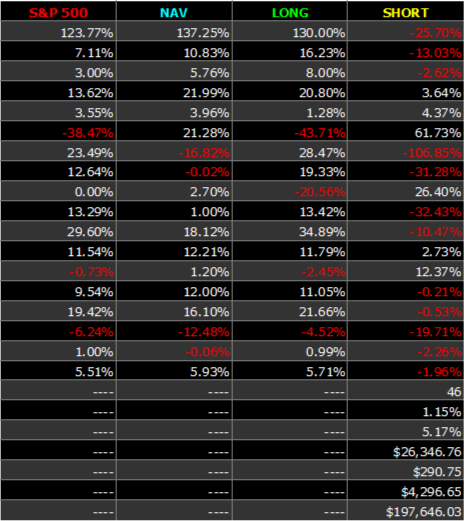 * The portfolio market capitalization statistics are calculated at the time the current portfolios are updated. The above table shows the returns of the individual Long and Short Portfolios for the current quarter. 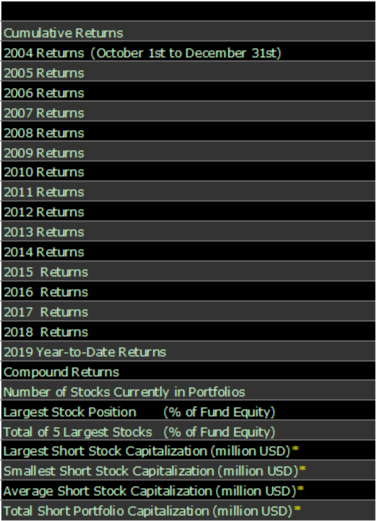 To review the returns of the previous quarters, please go to to the Portfolio Returns web page. © Copyright 2005-2018 Hedge Synergy Ltd.